For traditional Bavarian fun, nothing beats a good old-fashioned beer hall. Munich is Germany's beer capital, and its beer halls come complete with rivers of beer, cheap food, noisy fun, and oompah music. The partying gets turned up a notch every fall, when the city celebrates Oktoberfest. The festival lasts just over two weeks, starting on the third Saturday in September and usually ending on the first Sunday in October (but never before October 3 — the day Germany celebrates its reunification). Oktoberfest kicks things off with an opening parade of more than 6,000 participants. 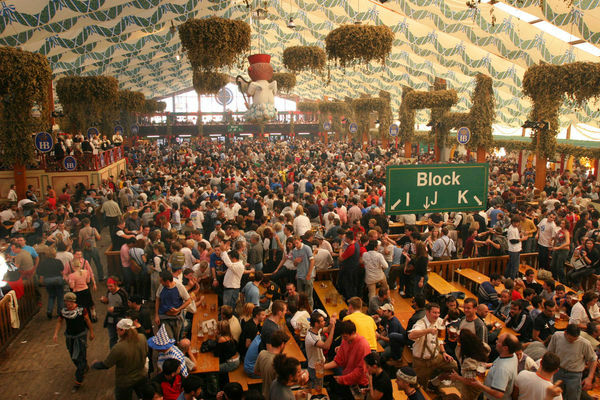 Every night, it fills eight huge beer tents with about 6,000 people each. A million gallons of beer later, they roast the last ox. The Theresienwiese fairground (south of the main train station), known as the "Wies'n," erupts in a frenzy of rides, dancing, and strangers strolling arm-in-arm down rows of picnic tables, while the beer god stirs tons of brew, pretzels, and wurst in a bubbling cauldron of fun. The triple-loop roller coaster must be the wildest on earth (best before the beer-drinking). During the fair, the city functions even better than normal. It's a good time to sightsee, even if beer-hall rowdiness isn't your cup of tea. If you're not visiting while the party's on, don't worry: You can still dance to raucous bands, munch huge pretzels, and show off your stein-hoisting skills any time of year at Munich's classic beer halls. While it can be extremely touristy, everybody's having lots of fun. When I was in Munich with my local guide, Georg, we stopped by his favorite beer hall, Der Pschorr. They have a big wooden keg out on display, but draw beer from huge stainless-steel dispensers. Every few minutes you hear a "whop" as they tap a classic old wooden keg. Hearing this, every German there knows they're in for a good fresh mug. I asked if they sell half-liters. Georg said, "This is a Biergarten, not a kindergarten!" He ordered us each the standard full Mass (liter glass — about a quart, nearly what we'd call "ein pitcher" — but it's meant for one person). Waitresses carry these heavy mugs as if they're weightless. While we enjoyed our time at Der Pschorr, first-time visitors shouldn't miss the Hofbräuhaus, a place that really lives up to the name "beer hall." 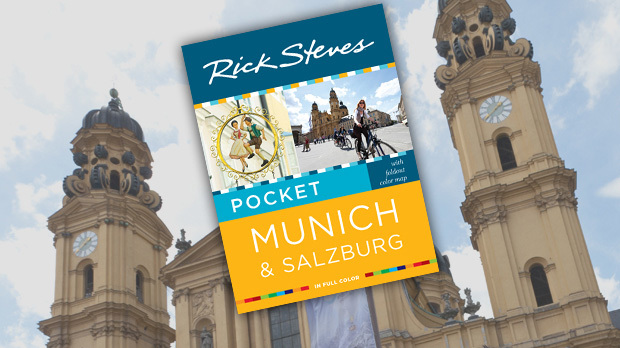 Although it's grotesquely touristy, it's a Munich must. The smoke-stained ceiling, repaired and repainted after WWII bomb damage, is an evocative mesh of 1950s German mod — Bavarian colors, chestnuts, food, drink, and musical themes. There are plenty of other intoxicating Munich beer halls. Spatenhaus is the opera-goers' beer hall, serving more elegant food in a traditional setting on the square facing the opera and palace. The trendy Andechser am Dom, at the rear of the twin-domed Frauenkirche, serves Andechs beer and great food to appreciative regulars. Nürnberger Bratwurst Glöckl am Dom, just across from Andechser am Dom, is popular with tourists. Dine outside under the trees or in the dark, medieval, cozy interior — patrolled by wenches and spiked with antlers. For the beer fanatic, there's the humble Beer and Oktoberfest Museum in the city center, which offers a low-tech and underwhelming take on beer's history and the origins of the city's Oktoberfest celebration. Wandering through the legions of happy beer-drinkers in the beer halls, it occurred to me that, unlike with wine, more money doesn't get you a better beer. 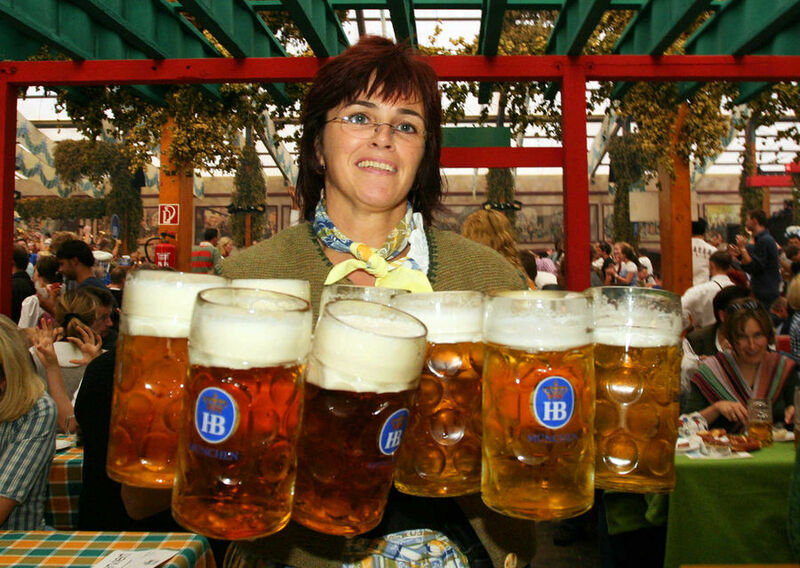 Beer is truly a people's drink, and you'll get the very best here in Munich. Connoisseurs have their favorite brews — and to get it, they don't pay more...they simply go to the beer hall that serves it. A beer hall is a classic Munich gemütlich scene. Gemütlich is the perfect word for Bavaria's special coziness and knack for savoring the moment. It's particularly strong during Oktoberfest, but you can feel it anytime by spending an evening in a frothy beer hall, clinking mugs with new friends, immersed in a boisterous and belching Bavarian atmosphere.